Rose said on stage Tuesday that he knew about the curfew and thought it was stupid. same thing in announcing he would play past the curfew. If tonight's Guns N' Roses show works like Tuesday's, you’d better take along something to read. You’re going to have some time to kill. Last night GN’R fired up at 9:45 p.m. — an hour and 15 minutes after Skid Row finished its 60-minute opener. Word rumbling around the Media Dude Grapevine was that singer W. Axl Rose was having some trouble working up enthusiasm. shall we say. for playing In the home state he left 10 years ago. The setting was perfect for a concert: A fat moon was drifting upward through the clouds, and the big stage glistened under huge banks of lights. The night air was warm and pleasant, the audience happy and excited. All it needed was a band. After an hour of No Band, the crowd began to grow agitated — chanting “Bull·—! Bull·—!“ at the stage. Slasher movie clips and cartoons shown on video screens had long since ceased to appease an amphitheater full of people expecting to be entertained. But once the music started, all seemed to be forgiven — and not without reason.What followed was some of the best hard, uncompromising rock and roll played around here this year, backed up by remarkably good sound and video systems. Playing a 16-song, hour-and-15-minute (plus encore) set dominated by material from its forthcoming ‘‘Use Your Illusion" I and II albums, GN'R didn’t seem to have lost any power in two years of laying low. If anything, the band has grown without sacrificing that street legitimacy that made them such an attractive, real alternative to sissified hair-spray rock back in 1988. And it’s pretty cool for a band to plow through a set full of songs the audience doesn’t know. It gives the show an edge that can be sadly missing from the Greatest Hits Compilations called concerts nowadays. Best song of the night? “Estranged.” written about a person but applicable. Rose said, to Indiana ("A place that makes me feel estranged"). It starts as a power ballad and builds, slowly and steadily, urged forward by Slash’s (Saul Hudson's) guitar, to a grandiose finish. Other good stuff: "Civil War." "Patience," "Fourteen Years," "Dancing with Mr. Brown-stone," "Knockin' on Heaven's Door," and a surprisingly good cover of "Live and Let Die," the Paul McCartney song written for the James Bond movie of the same name. Slash was in good form. One particularly effective solo segued from hot licks and showoff tricks into the theme from "The Godfather" — and it worked. His solo on "Double Talking Jive" shifted into an excellent pseudo-flamenco ending. Rose sounded good. too. If all you know of his voice is that nasal, wide-vibrato top end (described as Ethel Merman crossed with Jerry Lewis) then you’re missing his best — a powerful baritone register that stands apart from the air-raid siren school of rock singing. He understands dynamics, too — dropping the volume to give the music drama and anger in that menacing low end. Rose’s comments about Indiana — “1 grew up in this state for two-thirds of my life and it seems to me there are a lot of (bleeping) scared old people in this state” — indicate there may have been some truth in what the grapevine was saying about an attitude attack before the show. They also indicate it may be a while before ol' Axl is invited to sing "Back Home Again in Indiana" out at the racetrack. But that’s Guns N’ Roses. This has always been a band that demanded to be taken on its own terms and has been good enough to make that demand. The problem is the terms also include a price of $22.50 per ticket. Seems to me the people who pay it have a right to demand that the concert start at a reasonable hour, and a wait of 75 minutes between acts is squeezing reasonable until it screams. Skid Rows' set began with a take-no-prisoners urgency that was crippled, unfortunately, by muddy sound. The mix started to smooth out about five or six songs into the set and by the end of their hour became ... acceptable. It would have been nice to have the guitar a little more prominent in the sonic wash. Rock and roll doesn't live by drums and bass alone, even when it’s as aggressive as Skid Row was Tuesday night. Best songs of their 13: "Monkey Business." the new single, and "18 and Life." "Youth Gone Wild” was okay for a no-brain shout-along. Axl and company take their sweet time in delivering a sometimes-perfect show. Guns N’ Roses likes to make its fans wait, whether it be three years for an album and concert tour or — as the band did at Deer Creek Music Center on Tuesday — 90 minutes to come on stage. Was the wait worth it? Well, we’re still awaiting the album, which is now due in mid-July. As for the tour and concert, the answer is a qualified yes. Qualified because the quality of the show varied greatly and qualified because deadline allowed me to watch only the first hour and change of what was scheduled to be a two-hour show. At intervals, the Gunners were perfect. The opening number, apparently a new song, and its two successors. Out Ta Get Me and Bad Obsession, were blazing ex­amples of why Guns Ν’ Roses is arguably perhaps the best band in rock today. The mix was muddy for much of the first hour, but the band roared throughout. For softer reasons of this band's excel­lence, none of the 15.000-plus in the audi­ence needed to look further for examples than the brilliant anti-war, pro-rebellion song Civil War and Patience. On the negative side were the tepid but faithful cover of Paul McCartney’s Live and Let Die, a feeble new song called 14 Years and a ragged rendition of Mr. Brownstone. Sometimes, singer Axl Rose was magnificent. Friendly and smiling, his energy and manner were engaging. Watching him accept flowers and take the time to slap hands with people in the front row, you could almost forget the long anti-Indiana and anti-establishment tirade he spewed between the first two songs. Almost. Rose, who is from Indiana (as is rhythm guitarist Izzy Stradlin) can't get the Hoosier state out of his spleen. For five minutes, he railed against police and the state in general. He declared Guns N’ Roses to be "one of the only things these kids got" and added. “I got a lot of (bleeping) cool prisoners here in Auschwitz." Some people don’t know when to shut up. And Rose, immensely talented though he is, is one of those people. He ought to get over it. There are people with real problems out there, and the meager gripes of a millionaire rock star don’t amount to a hill of beans in this crazy world. The best part of the show’s first half was watching guitarist Slash perform. His leads were exquisite, heavy on performance and sound rather than speed and flash. Slash’s best moment came when he led new drummer Matt Sorum from his thumping, five-minute solo into the theme from The Godfather. Guns N’ Roses will be back at Deer Creek tonight for a second show. Those attending should hope for more Slash, less talking by Axl and a cleaner sound. One-hundred sixty-eight arrests, citations and warnings were made by Indiana and Hamilton County law enforcement authorities at Tuesday night's concert by the rock group Guns Ν' Roses at Deer Creek Music Center. Although no exact arrest totals were available from law enforcement authorities, it was estimated by police officers at the event that about 100 people were arrested. About 90 people were arrested during the two days of shows by The Grateful Dead performed in 1990. County sheriff's Sgt. 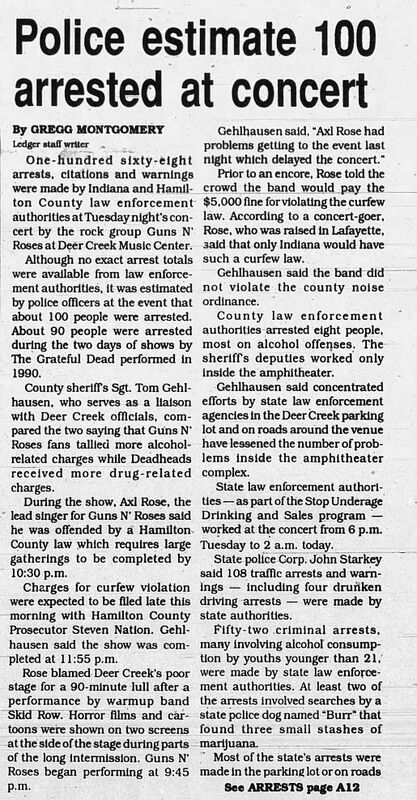 Tom Gehlhausen, who serves as a liaison with Deer Creek officials, compared the two saying that Guns N' Roses fans tallied more alcohol-related charges while Deadheads received more drug-related charges. During the show, Axl Rose, the lead singer for Guns N’ Roses said he was offended by a Hamilton County law which requires large gatherings to be completed by 10:30 p.m.
Charges for curfew violation were expected to be filed late this morning with Hamilton County Prosecutor Steven Nation. 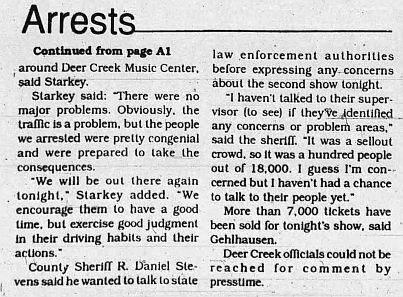 Gehlhausen said the show was completed at 11:55 p.m.
Rose blamed Deer Creek’s poor stage for a 90-minute lull after a performance by warmup band Skid Row. Horror films and cartoons were shown on two screens at the side of the stage during parts of the long intermission. Guns N’ Roses began performing at 9:45 p.m., Gehlhausen said. “Axl Rose had problems getting to the event last night which delayed the concert." Prior to an encore. Rose told the crowd the band would pay the $5,000 fine for violating the curfew law. According to a concert-goer. Rose, who was raised in Lafayette, said that only Indiana would have such a curfew law. Gehlhausen said the band did not violate the county noise ordinance. County law enforcement authorities arrested eight people, most on alcohol offenses. The sheriffs deputies worked only inside the amphitheater. Gehlhausen said concentrated efforts by state law enforcement agencies in the Deer Creek parking lot and on roads around the venue have lessened the number of problems inside the amphitheater complex. State law enforcement authorities — as part of the Stop Underage Drinking and Sales program — worked at the concert from 6 p.m. Tuesday to 2 a.m. today. State police Gorp. John Starkey said 108 traffic arrests and warnings — including four drunken driving arrests — were made by state authorities. Fifty-two criminal arrests, many involving alcohol consumption by youths younger than 21, were made by state law enforcement authorities. At least two of the arrests involved searches by a state police dog named “Burr" that found three small stashes of marijuana. Most of the state’s arrests were made in the parking lot or on roads around Deer Creek Music Center, said Starkey. Starkey said: “There were no major problems. Obviously, the traffic is a problem, but the people we arrested were pretty congenial and were prepared to take the consequences. “We will be out there again tonight," Starkey added. “We encourage them to have a good time, but exercise good judgment in their driving habits and their actions." County Sheriff R. Daniel Stevens said he wanted to talk to stale law enforcement authorities before expressing any concerns about the second show tonight. More than 7,000 tickets have been sold for tonight’s show, said Gehlhausen. Deer Creek officials could not be reached for comment by press time.